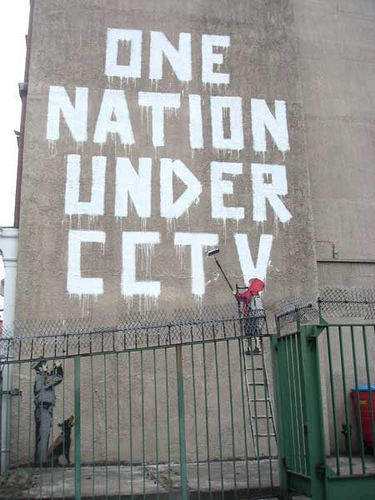 Before last spring, anyone who walked down Oxford Street in London and happened to glance down Newman Street would see a 23-foot high mural that spelled out, “One Nation Under CCTV,” in dripping white lettering. Below the words, and perched atop a painted ladder would have been a red hooded boy holding a paint roller, and at the foot of the ladder, a policeman would have stood with a camera held out toward the boy, accompanied by his ferocious canine. Unfortunately, the Westminster council voted to paint over the piece of street art. Art critics criticized the council decision, claiming that the mural was valid, vibrant, and interesting, and should remain untouched. In the end, those critics’ efforts did not make a difference. The artist of the piece calls himself, Banksy, and works in a medium of stencil and spray paint. His works have appeared on the streets of London, Bristol, and New Orleans, among other locations. So why did the decision to remove a piece of London graffiti have such a profound affect upon me, a resident of a small suburban town in New Jersey? It did because I studied abroad in England for the entirety of my junior year of college, the first month of which was spent in London, and during that month, I organized a walking tour that visited a handful of existing Banksy pieces in the city. The “One Nation Under CCTV” work was the first stop of our tour. In the shadow of the painting, my three fellow walking tour leaders and I explained to the rest of our study abroad program about the workings of CCTV, a system of cameras that record the goings-on in public places across the United Kingdom. Banksy created a great deal of graffiti that criticized the CCTV system, another of which we visited later in the tour. That piece featured the words, “What are you looking at?” painted below a broken CCTV camera in an underground walkway, right near the Marble Arch tube stop. I view the research process for the walking tour as my England initiation. My group and I navigated the Underground for hours on end and took long, often fruitless walks down London streets in search of the Banksy pieces the government had not yet painted over. While the other student groups kept their research concentrated in the West End, we challenged our comfort zones and traveled into poorer, most Eastern areas of the city. The tour also sparked my interest in the world of street art. I found it fascinating that these simple spray paint and stencil creations have the ability to evoke such a spectrum of emotions in their viewers, and how their locations outside of museum walls facilitate these reactions. “Some people want to make the world a better place,” Banksy once said. “I just want to make the world a better-looking place. If you don’t like it, you can paint over it!” Unfortunately, “paint over it,” is what the government often does. In June of last year, a few days before I boarded my plane home, I took one last walk down Oxford Street. On instinct, I glanced toward the spot where the CCTV piece once was, and my eyes fell on a blank wall. I heaved a sigh of disappointment. This was visible evidence that London had changed since my arrival, nine months prior. But then again, so had I.